Sunday barbeques, holiday picnics and, comfort dinners on weekends are absolutely incomplete without a barbeque grill. However, such luxuries in life do not come without endless research and contemplation. And, after weighing the benefits and drawbacks, settling for the best charcoal grill seems like a never ending task when you are spoiled with options. So, if you have a huge backyard and, if Sundays are usually house full with mouth watering turkey roasts and seared pork chops with people yapping nonstop, owning a good charcoal grill for barbeque would seem like a dream come true. One must keep in mind the cooking space, its cleaning system and maintenance of a barbeque grill when buying one. 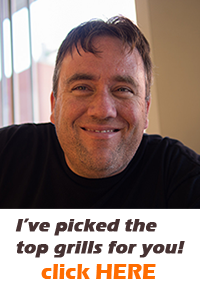 So, for all the barbeque enthusiasts who enjoy slow cooking their animal proteins and, love to infuse smoky flavours in their cuisines, there is good news! Weber Original Kettle 22 inch charcoal grill is one of the fast running options in barbequing. Let’s get through some interesting features of this charcoal grill. 3 What factors weigh Weber 741001 Original Kettle 22 Inch Charcoal Grill down? 4 Why buy the Weber 741001 Original Kettle 22 Inch Charcoal Grill? The grill is about 22 inch long, 25 inches wide and 38.5 inches high. It contains a porcelain enameled bowl that comes with a lid containing glass reinforced nylon handles. The bowl has a steel finish making it resistant to rust, wear and tear over years of use. The nylon handles are sturdy and durable, owing to high flexural and tensile strength of owing of the glass fibre reinforced nylon which, is also heat and wear resistant and, has an excellent hear deflection temperature. Therefore lifting the lid is not an issue to intermittently check the cooking of the protein under the cloche. This version of Weber Original Kettle grill gives a peak temperature of about 1500 F.
Approximately 363 sq inch large cooking space on the kettle grill. Steel cooking grate that measures 22 inch in diameter placed in a porcelain bowl covered by a lid. Vents which are resistant to rust. Aluminium ash catcher that ensures a flawless cleaning system. Weather resistant wheels held firmly by three aluminium stands. The Weber 741001 Original Kettle 22 inch Charcoal grill has some of the best time tested features that not only assure you completely flavoured and slow cooked food but also, a safe and hassle free cooking. If you take a look at the structure of Weber Original Kettle grill, the porcelain bowl with the lid resembles an apple shaped pot with a safety handle. The porcelain enamel make of the bowl can endure a temperature up to 1500 deg Fahrenheit and, the grill is designed to resist burn and rust through the slow cooking. The shape of this bowl ensures a smooth and a slow circulation of heart within the grill resulting in even cooking of the protein. So, if operating this beautiful Weber Original Kettle grill were easy, understanding the functionalities of each feature in the grill is fun too! Weber 741001 Original Kettle 22 inch Charcoal grill is provided with an interesting feature known as the damper. Made of rust resistant aluminium, it kind of resembles the steering wheel of a car. However, this important feature is the signature aspect in many of the Weber products. The damper essentially controls the intensity of the heat without the need for the lid to be lifted often to regulate the heat flow. Adjusting the damper adds flexibility in heating the grill as per the cooking temperatures preset for the protein. For instance, certain foods like pork require a long time to cook whereas; steaks that are served rare to medium rare require a golden searing on the surface. Hence, by adjusting the damper, the amount of oxygen infused can be regulated with precision on how long enough the food needs to be cooked or, how high a protein like steak needs to be seared. Next, comes the cooking aspect in Weber 741001 Original Kettle 22 inch Charcoal grill. The grill contains a cooking grate that is made of heavy duty plated steel and, has hinges on either side. These hinges make it easier for the fuel access with no requirement of lifting the whole grate off the grill. With an ample cooking space, the grate has an excellent heat retention that not only ensures slow and fine cooking but also, leaves luscious sear marks on the protein during the time of cooking. Be it cooking heavy proteins like beef and pork, or roasting small game proteins like quails, be it searing steak and vegetables like asparagus or, roasting cobs, cooking is absolute fun on this beautiful steel coated grate. The cooking grate in this Weber Original Kettle grill is built to withstand the intense heat emanating from the charcoal fire. Besides, the charcoal grates also give you the flexibility to cook with a direct or an indirect setup, depending on your choice and convenience. However, no cooking is free from the hassles of what follows later – the cleaning! 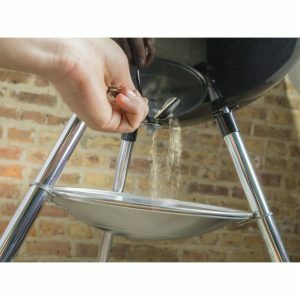 But Weber 741001 Original Kettle 22 inch Charcoal grill apparently has come up with a one-touch cleaning mechanism. The grill is equipped with a beautiful aluminium ash catcher beneath the barbeque bowl. Three steel blades are provided underneath the Weber Original Kettle grill. So, on rotating the handle of the bowl, the blades begin to move, churning the ash out through the ash resistant vents, into the ash catcher. The provision of vents with the blades beneath the grill ensures there is no clogging of ash in the vents thereby, ensuring complete safety while using this charcoal grill. Besides providing with a hassle free cleaning mechanism, the three blades along with the vents that connect into the ash bowl also play the role of a secondary damper. The vents that allow ash to fall on the tray also are pathways for fresh oxygen to enter from beneath, thereby fueling the fire and, keeping the temperature regulated on the grill. The best feature about this Weber Original Kettle grill is its portability. The grill is equipped with a pair of sturdy all weather wheels that makes it easy to move wherever you feel like getting your barbeque and smoking in action. What factors weigh Weber 741001 Original Kettle 22 Inch Charcoal Grill down? Despite being an amazing choice for aspiring chefs and barbeque lovers, Weber 741001 Original Kettle 22 Inch Charcoal Grill has its negatives. The metal finish has been found to be thin with the heat transferring to the surface and, making it almost impossible to touch the lid when cooking. Besides the handles which are glass reinforced nylon made, also heat up quickly. So, hand gloves are strictly recommended when lifting the lid to check the cooking of the proteins. However, one of the major misses in this charcoal grill is the inability to adjust the height of the cooking grate. To be precise, there is no inbuilt mechanism that ensures the moving of the grate far or close to the fuel. Hence, it gets expensive when buying the charcoal for the fire, when more amounts of the same are needed to keep the heat fluctuations in control and, on a constant note. Also, the damper gets very hot during the course of cooking. After all, the vent dial is made of aluminium which is an excellent conductor of heat. Hence, a little carelessness on the user’s side can lead to scalding burns on the fingers. And, the three legs on which the whole grill set sits are made of pure aluminium too. Aluminium is after all, a light weight metal and hence, there are some unpredictable contingencies regarding the stability of the grill set. The other hiccup in using this Weber Original Kettle grill, is adding of the charcoal through the course of cooking, given that the cooking grate is one whole piece. The other apparent negatives are absence of a side table in the grill set. Essentially, a side table is crucial for barbeque setups as one might need the bench for preparing the proteins before cooking. A side table comes handy in the later part too, when you have to keep the steaming food aside. A utensil holder is missing in this charcoal grill set. Besides, going through the assembly is not exactly a cake walk as it is made to sound. Despite an assured success in getting the perfectly cooked sausages, hot dogs and barbeque chicken, there could be issues in searing steaks and beefs as the positioning of the heat source is not flexible. 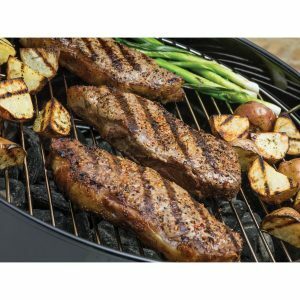 Why buy the Weber 741001 Original Kettle 22 Inch Charcoal Grill? Despite some misses here and there, Weber 741001 Original Kettle 22 Inch Charcoal Grill still comes across as a winner as compared to its competitors in the Weber brand itself. Competitors like Jumbo Joe and Smokey Mountain cooker although have a lesser cooking space then this Weber Original Kettle Grill, are lighter than the latter. Besides, Smokey mountain cooker has an inbuilt thermometer to give precision in the cooking temperature and, also contain double plate steel cooking grates. But any charcoal grill can become a messy affair after the cook. And, it is here that the Original Kettle 22 Inch charcoal grill trumps the others when it comes its one touch cleaning system. The ash is collected on a plate and, is easily removable after the cook is over. The triangular design of the grill makes the structure sturdy, stable and strong as compared to four legged grills. With a strong axle support and, with the weather free wheels, the portability of this Weber Original Kettle Grill is best. The assembly of the parts of the grill requires basic technical skills that are stated in the manual. The grill itself is air tight and hence can be used effectively as an indirect heat smoker. Leaving aside the few negatives, Weber 741001 Original Kettle 22 Inch Charcoal Grill delivers absolutely on the taste front. Roasting a turkey or chicken or be it searing pork chops, this grill is a winner in terms of money and value as the protein absorbs the charcoal flavour completely sans any flare ups! One can choose to pile the charcoal briquettes on one side or, use a charcoal rail to spread the briquettes evenly. For a better control on fuel consumption, one can decide precisely over the loading of charcoal. Charcoal rails should solve the piling issue and, aid in cooking that demands more smoking of the food. If budget is an issue, bricks can also be used instead of rails for heat retention. Lump charcoal can be used instead of briquettes if ash collection is a hassle. Weber Chimney Fire Starter is also recommended for a faster ignition of fuel. So, next time if you are planning on a feast with beer can chicken, roast turkey or braised hams, you know what you should be gunning for! 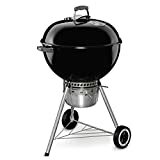 With a big back yard and with, a loving crowd filled with uncles, aunts, children and friends, your dream of getting the perfect charcoal grill springs to reality with the purchase of Weber 741001 Original Kettle 22 Inch Charcoal Grill. With a 10 year warranty, it is also ANSI certified and CSA listed, making it an extremely reliable purchase. With an even heat distribution, slow and steady heat retention and with a larger cooking space than its contemporaries, this Weber Original Kettle grill fits your brief of an ideal charcoal grill. It is sturdy and portable too, besides not being too difficult to assemble. Another advantage of owning a Weber brand is easy availability of replacement parts, which is a big relief for people who are more into online shopping. A Weber charcoal chimney is advised if you are concerned about over smoking and burning your foods. And, you also get a cook book as a bonus! So, if you are an aspiring chef or a home cook who loves to connect with people through food, Weber 741001 Original Kettle 22 Inch Charcoal Grill is a catch, for sure!